Psychological ownership is that feeling that “this is mine”. We clearly get that feeling when we do own something. But we also feel attached to things as being “ours” even if we do not own them. Many people, for instance, have a deep attachment to a football club, even calling it “my” club. Others have a sense of ownership of items they share and do not own outright. They say it is “my car”, when actually it is jointly owned with another family member, such as a partner. The sense of owning something – even when we do not – is an essential aspect of our understanding of ourselves as individuals. What we “own” helps define us and knowing what we own helps us be sure of who we are. And when that happens, we can operate in the world more effectively. If we had a limited understanding of our own individuality, we would find it hard to operate on a daily basis, so a sense of ownership helps us “be normal”. There are several signals to the concept of psychological ownership that we check to determine whether something “is ours”. Location is important – if it is close to us, then we get a greater sense of ownership. Similarly, the knowledge of a transaction taking place, such as paying for it or being handed the item as a gift, is another crucial factor in our sense of ownership. However, we also get psychological ownership through touch or through using something. These are areas in which businesses can help create a sense of ownership, thereby enhancing the likelihood of a purchase. Many businesses already create a sense of psychological ownership so that they can increase sales. Clothes stores do this all the time. They have changing rooms so you can try on the items you like. The notion is that this is so you can check the size. That’s only partially true because most people know what size to buy already. They don’t need to try on clothes to confirm the size, even though the shop might suggest that’s the reason for changing rooms. A significant value to clothes retailers from changing rooms is the sense of ownership it helps create. Once you have tried on the item and you are wearing it, seeing yourself in the mirror, you become much more attached to it. Trying on creates psychological ownership, and it is much harder to reject the item once that has happened. 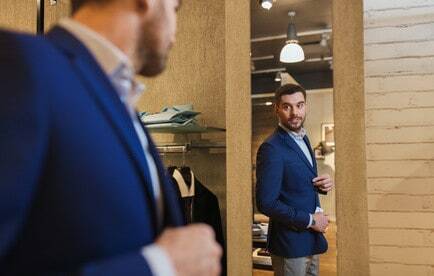 Changing rooms in clothes stores help increase sales due to the enhanced level of psychological ownership they help create. Shoe shops do the same. However, it’s not just clothing stores that do this. Car sales outlets work on the same principle. You are offered a test drive, in many instances where you take the car home for the weekend driving it around to your heart’s content. It is much harder to reject the car and not buy it because you have had 48 hours sensing you have owned it. Housebuilders also offer similar concepts, as do some estate agents. Rather than just visit a new property for 20-minutes, they suggest you can stay in it for the weekend. They sell this idea on the basis of it being your largest lifetime purchase, so you need to spend time considering it. Again, that is true. However, when you have spent 48 hours living inside a house you might buy, your sense of ownership kicks in, and it is much tougher to ignore the potential deal. Property developers increase their conversion rate using “home trials” thanks to psychological ownership. Even if you run an online business, you can boost the chances of a sale using psychological ownership. Companies that sell software have 30-day trials, for instance. If you have used the product for a month, the likelihood of buying is high. Whereas if you cannot try the product you don’t get a sense of ownership. Similarly, the “freemium” model of online services creates psychological ownership by allowing people to sign up for a service and use it free of charge, only costing money when premium features need unlocking. The free version provides people with a secure attachment to the service and therefore the conversion rate to paid-for plans is higher than would otherwise be the case. Even service companies can provide psychological ownership. Remember, we can become attached to intangible things too. So merely creating “membership” of a website for something like a firm of accountants would make those members feel “this is my accountant”. Whatever you sell, you can increase your conversion rate and make people more likely to buy if they feel they already own the product before they have parted with any cash.